Recently, however, investors have begun to flock to the Philippines. This is partly due to President Aquino’s anticorruption reforms, which have helped the country become more business friendly, moving up 30 spots on the World Bank’s Ease of Doing Business Index since he has been in office. Despite the tragic losses due to Typhoon Haiyan, the Philippines’ GDP growth rate remained at 7.2 percent for 2013. 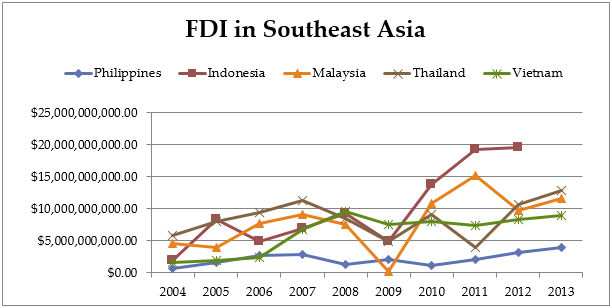 FDI is even more likely to take off as it becomes simpler for foreign banks to set up shop. This new policy has major human development implications as well. One of the many advantages of increased FDI is the skills development, technology transfer, and job opportunities that it brings. While human development in the Philippines has improved drastically in many ways, the unemployment rate—which has stubbornly remained above 7% for the past fifteen years—is still a major challenge. 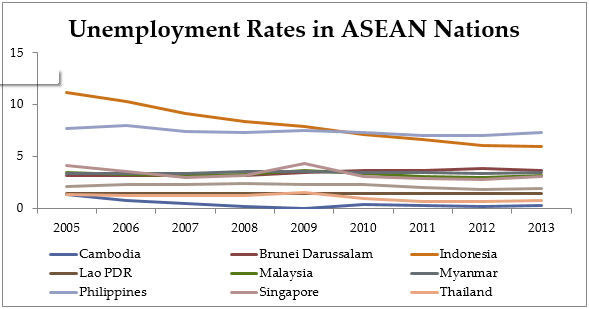 In fact, the Philippines has had the highest unemployment rate among ASEAN member states since 2010. Particularly in the wake of Haiyan, which caused many to lose their livelihoods, the job opportunities that will accompany a liberalized banking system have the potential to be extremely important. With the beginning of ABIF commitments in 2015, all ASEAN banks will be classified as local as the region moves forward with plans to become its own economic zone. The hope is that this reform preempts any concerns over the forced opening ABIF will precipitate, and that the Philippine banking sector will be strengthened and better prepared for integration. While this is one necessary reform among many, it may serve as a bellwether for international observers and investors. During a July 15 visit, World Bank President Dr. Jim Yong Kim said that he believed the Philippines could represent the “next Asian Miracle”. With a young English-speaking workforce, strong macroeconomic fundamentals, and a stable regime committed to reform all the conditions are present. This bank liberalization could be the next big step in opening the floodgates to investment, and allowing the Philippines to realize its economic potential.